Before Europeans came to America, Christian traditions and practices were well-rooted in Europe for over 1000 years. Catholicism was the predominant form of Christianity, at least until the Protestant Reformation of the early 1500s The Protestant Reformation was a major schism is Western Christianity that ultimately influenced America – both before and after independence. Whereas the US Constitution’s First Amendment (ratified 1791) granted religious freedoms for individuals and that government cannot establish religious preferences, I content that American has a long history of battling this ideal by continually challenging it in the name of religious preference. As the Puritans came to America (1630) seeking religious freedom in their disagreement with the Church of England (Anglicans), they established the Massachusetts Bay Colony in order to establish an orthodox community seeking to save their perception of Christianity from the wayward Anglicans. Puritans saw themselves as the chosen people – the new Adam and Eve with the American colonies being the New Jerusalem – the new Israel. Yet, I think of Puritan Anne Hutchinson, a well-spoken and well-versed Puritan who Puritan leadership banished for heresy. I think of Puritan Roger Williams, who Puritan leadership banished, so he went on to establish a new colony of Rhode Island. In the 1740s, Rev. George Whitefield (an Anglican cleric) came to America. Without a congregation, Whitefield, a vibrant orator, travelled throughout the colonies preaching a message of rebirth and revival to large crowds in towns and fields. Not only did Whitefield help spread Methodism in America, Whitefield and his contemporaries fueled the Great Awakening in America. Yet I think of those who opposed Whitefield – the Anglicans whose doctrine did not support rebirth and revival. – and the Puritans who challenged Whitefield cause his message conflicted with their orthodoxy. I think of the Evangelical Baptists from Pennsylvania whose preaching in Anglican-centric Virginia spurred harassment and imprisonment. I think of the religious freedom voices uniting with the freedom of liberty voices. There’s Thomas Jefferson who drafted the Virginia Statute for Religious Freedom (1777) supporting the non-Anglicans. Anglican opposition would prevent its passage for nine years. After this statute became law, it would serve as the framework for the First Amendment (ratified 1791). As a young America grew, westward expansion followed. As people moved westward, revivals also moved across the frontier to save souls. Methodists rapidly grew in numbers. In time, they engaged is societal causes as orphanages, jails, caring for the poor, education, anti-slavery, and supporting women. They also saw education as an important role in creating good Christians for society. This activism favored a Protestant America in the New World. Yet, I think of the large numbers of Catholics and Jews migrating to America in the mid-1800s – yet Protestants did not perceive Catholics and Jews as one of them. Protestants now became the persecutors of religious freedom by using schools to deliver anti-Catholic and anti-Semitic views. I think how animosity between Protestant and Catholics would endure into the 1960s – and is same ways, still being present today. The 20th and 21st Centuries provides the backdrop for increasing immigration of Muslims to America. Coupled with the presence of second generation Muslims, Pew Research projects Muslims will be the second largest group in America by 2040. Yet I think about how anti-Islamic attitudes attempt to block the building of mosques in various communities. Let alone the general anti-Islamic rhetoric I hear in conversations and on the news. I think about how political candidates who are Muslim face increased scrutiny – or as some politicians promote anti-Islamic and/0r pro-Christian views. I think about today’s conservative Christians promoting anti-religious claims as the attempt to ingrain their beliefs through a variety of religious freedom laws throughout the country. I think about the extremes attempting to establish a Christian America and those believing in the exclusion of religion from all aspects of public life. I think about the growing number if Americans with either no religious preference or unabashed Atheism. I think about the difference between school teaching religion and teaching about religion – with people worrying that the latter is about advocacy and indoctrination. The US Constitution’s First Amendment is overtly clear. Yet, American has a persistent history of challenging the First Amendment in the name of their religious preference – a history of religious freedom advocates turning into inhibitors of religious freedom. Although the First Amendment has endured, I wonder if people understand it. Walls can surround to keep something out. Walls can also surround to keep something in. Either way, walls divide. Walls are barriers – and barriers can come in different forms. Rick Steves is a respected travel guru in the U.S. – especially specializing in Europe. His shows and books are very well done, and one we appreciate for our travels. We have not taken any of his tours, but everyone that I know who has rave about them. A new American president has made quite a splash in the news. Although he states his desire to be a president for all, his actions do not support his statement. After all, actions are more powerful than words – or as I like to say, behaviors and actions demonstrate one’s true value. Rick Steves has a perspective about building a wall and actions that act like a wall. To me, this is a worthy and powerful read. Click here to read it. I attended a lecture about Islam that was part of an interfaith dialogue series at a local church. On this night, a professor from a Lutheran seminary delivered the lecture and answered questions that led to small group dialogue among the participants. In the discussion group served as an opportunity for misconceptions to come forth. For instance, a person in my group stated there are just as many mosques in the US as Christian churches. I relentless challenged him and used it as an example of the importance of learning, thus I had difficulty giving credence to his other point. Back to the lecture, are some points that the lecture increasing my awareness. I did not know that the Islam creation story involves Adam and Eve. I did not know that the Qur’an includes many Biblical characters as Abraham, Joseph, Noah, Jonah, Miriam, Job, Mary, and Jesus (to name a few) … yet one character’s story may be interspersed over other chapters. I did not know that after the opening chapter, the Qur’an’s 114 chapters are generally from longest to shortest, thus not chronologically. I did not know that the root that Qur’an means “recitation”, whereas Bible means “books”. I did not know that some of the differences between Christianity and Islam in found in telling the same story with a different context. No matter the topic, there are three categories of information: what one knows, what one thinks they know, and what one does not know … and that middle category is where one finds their misconceptions and misinformation – the basis for many ills in society. Regardless of the type of media, there was no shortage this past week of 9/11 stories. Sorrow, confusion, fear, pride, anger, grief, emptiness, and dismay – the stories were there to capture the emotion – as they were there to capture heroism, patriotism, or genuine service and compassion. This post is not about recounting where I was on that day; nor of my personal encounters with that day; nor is it to rehash the countless stories that already exist – but to stimulate thinking. Learning is an important tool for everyone. All one has to do is read online comments regarding anything about Islam to conclude that many, if not most, American non-Muslims know very little about Islam and hold many misconceptions. Forgiveness, an important Christian foundation, is something that one must do in order to heal their wounds. 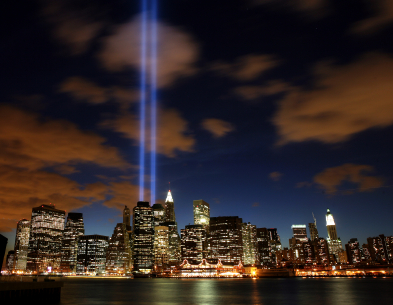 My November 16, 2010 post about forgiveness concludes with a challenge regarding 9/11. It is my nature to be reflective and positive about life. I appreciate the image above because it reminds us of what was and illustrates the light of hope for what is to come. And yes, a positive image. Forgiveness was the topic in a recent adult Sunday school class at my church. We discussed several examples of publically proclaimed forgiveness as the Amish community forgiving the surviving family of the person whose murder-suicide spree at a local school shocked the community. My hallmark act of forgiveness was watching Pope John Paul II visit the imprisoned person who shot him, and then grant him forgiveness. The reconciliation period for South Africans after years of Apartheid was a monumental cultural event involving forgiveness. As Lutherans, we also aware of our own denomination recently seeking forgiveness from the Mennonites/Anabaptists for the persecution Lutherans did to them hundreds of years ago during the Reformation period. Through the words of the Lord’s Prayer – “Forgive us our trespasses, as we forgive those who trespass against us” – we ask God for forgiveness to receive forgiveness and to forgive others. Yet, how often in our life do we ask forgiveness from someone? How often do we go out of our way to grant someone forgiveness for something that deeply hurt us? How often do we receive forgiveness from someone for something we did? If our group is an indication, events of forgiveness do not common occurrences – even though our doctrine is very clear: As a corollary to God’s forgiveness, ELCA Lutherans believe that all Christians have been given the responsibility of forgiving another’s sins against them (Matthew 6:14, Mark 11:25, Luke 17:3ff). I think of a person with whom I’ve had limited discussions. On our first meeting (and to my surprise) he told me his story of the hateful burden brought upon him by someone close. Months passed, and then I heard the same story in our second encounter. Later it hit me – the only way he can free himself of the baggage he carries is by forgiving the person who deeply hurt him. Unfortunately, our paths have not crossed in some time because I need to say that he is in command of his own heeling. Today’s culture has its share of attitudes as “in your face” and “don’t get mad, get even.” Many glorify the behaviors demonstrated on reality shows. The instant nature of today electronic media also has a tendency to promote bitterness, grudges, lawsuits, resentment, and mistrust. Our political climate is a story in itself. First, the proposed building is not at Ground Zero – it’s two block away. I know that is it very close, but I prefer using near instead of at or on. President Obama said Muslims have a right to build a mosque at the proposed site. Of course he’s Constitutionally correct. He did not use the verbs that many in the media used as support, endorses, promotes, approves, and countless of others. Meanwhile, a Fox News poll has 34% that say the situation is against our Constitution! Well, these people are obviously misinformed. President Obama said Muslims have the right to build the mosque, while reminding us that he did not comment on the wisdom to build the mosque in the proposed location. Again, 100% correct. The wisdom of the building choice is the key question. The same Fox News poll supports this notion. I normally don’t read columnist Charles Krauthammer. Although I don’t agree with him 100%, I appreciated his effort here – but he returned to his myopic view in his next column. Building elsewhere is a consideration, but I ask “How far away is far enough?” Apparently, Murfreesboro, TN is not. On GOP Chairman Michael Steele saying President Obama is going against the wish of Americans by stating the administration is again tone-deaf to what the American people are saying. Hmmm … that’s interesting Mr. Steele, not according to the a poll at one of your favorite news sources (Fox News). Mr. Gingrich (and others) point to the number of Christian churches in any Middle Eastern country as an argument – which is irrelevant! This is America, a country governed by American law based on our Constitution. Actions elsewhere do not interpret our Constitution. Tolerance is important, but tolerance is a two-way street. I normally don’t read Ross Douhat, but I appreciated this column and its unexpected twist. Perhaps those seeking to build the New York mosque will defuse the situation by seeking a less controversial site. I wonder why planners would want to continue moving forward with so much opposition. After all, it will only take one or a handful of our kooks to make some tragic happen on that site. I wonder if Fox News relentless coverage while airing quotes as “the center will serve as a breeding ground for terrorism” is an intentional ploy to fan the flames. Oh that’s right – Fox News is fair and balanced – not biased. Shame on me for thinking as such. This is a New York issue, thus I can find NO reason for any candidate in any state other than New York to use this issue in their campaign. (Yes, I have seen too many quotes of this.) Perhaps, that identifies President Obama biggest mistake – simply commenting on the issue. I end with this Richard Cohen column. The proposed building of an Islamic center (known as Park51) two blocks from Ground Zero is creating quite the stir, and some news sources (whom I will remain unnamed) have spent consider time on the issue. Instead of writing about my opinion on this issue, I thought I’d gather a variety of articles with wide-ranging opinions to allow readers to get their own opinion. By the way, I listed the sources alphabetically.